The Temporary Chief Constable of Lincolnshire Police, Neil Rhodes, has been suspended from duty due to allegations of "potential conduct matters". The matter has been referred to the IPCC. Deputy Chief Constable Alec Wood will be the acting Chief Constable while the investigation is ongoing. The statement by Lincolnshire Police is understandably terse. "It should be emphasised that suspension is a neutral act and it should not be inferred from the decision to suspend that the potential conduct matters have been proven." They're not even hinting about what kind of misconduct Mr Rhodes is accused of, which invites all sorts of wild speculation into the mental gap whilst we wait for the truth. Is it financial irregularities, harassment, or horse meat trading? Margaret Dickinson has recently launched her new book, The Clippie Girls. 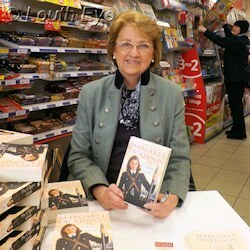 She was in Louth to sign copies at WHSmith and Wrights bookshops on Wednesday 27th February. The story is all about a young woman who works on the Sheffield trams in the 1940s. Talking of books, in July my new novella will be published. It's called The Secret Eater, and it's a young adult fantasy with demons, dragons, and dodgy disco dancing. YOU WILL LOVE IT! Ahem. If you would click the link to read more, if you are so inclined, then I will be eternally grateful. Thank you kindly. The Meridian Leisure Centre swimming pools will be closed all day on Saturday, March 2nd, Sunday, March 3rd and Saturday, March 16th, 2013 for the Lincolnshire County Championships Swimming Galas. Only the pools will be closed, the fitness suite, sports hall and dance studio will be open as normal. 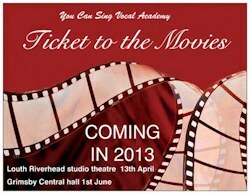 You Can Sing Vocal Academy will be performing Ticket To The Movies on 13th April at the Riverhead Theatre. There's still plenty of time to get involved if you like to sing pop music. The group meets on Monday nights at St Michaels and All Angels studio, Mount Pleasant. Classes for kids run from 5-6pm, and it's 6-7pm for the adults, and they involve learning some dance moves as well as singing. It's quite a buzz to get on stage and perform as part of a vocal group, so I would recommend it to anyone. Two rallies took place. One was considerably more coherent than the other. Lincolnshire Police publish a video announcing how budget cutbacks will impact county policing.